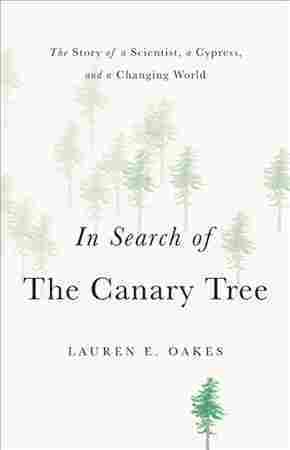 'In Search Of The Canary Tree' Highlights The Links Between Nature, Climate And Us Conservation scientist Lauren E. Oakes weaves her musings about humans' place in a warming world together with conservation science in a moving and effective way. Higher sea levels, displacement of millions of people, disrupted agriculture, and more extreme weather events are predictions for the future in an October U.N. climate report. These events will occur, the U.N Intergovernmental Panel on Climate Change concluded, if we don't manage to limit global warming to a particular level — requiring, at minimum, a 40 percent reduction in greenhouse-gas emissions over the next 12 years. But these emissions are on the rise. Knowing this, how can we fight a loss of hope as we envision a turbulent world for our children and grandchildren? How can we help bring about the change necessary to reduce the chances that these predictions will come true? Conservation scientist Lauren E. Oakes offers some answers from an unexpected corner: her research on yellow-cedar trees in southeast Alaska. In her new book In Search of The Canary Tree: The Story of A Scientist, a Cypress, and a Changing World, Oakes describes how she worked (with her research team) in remote coastal areas to capture a statistical picture of warming forests. She also includes interviews with Alaskans ranging from loggers to artists about what the decline in yellow-cedars mean to them. This marriage of ecological and social science gives broad meaning Oakes's basic research question: What happens in forests when yellow-cedars die off? Happily, Oakes can really write. She weaves her musings about humans' place in a warming world together with conservation science in a moving and effective way. The yellow-cedar is the book's star. Found along the Pacific Coast from California to Alaska, Callitropsis nootkatensis goes also by the name "yellow cypress" and is a relative of the giant sequoia. The yellow-cedar is a boon to the timber business, a sacred tree to native peoples and slowly dying off — all at the same time. It's decline, in part, is caused by is the shift in seasons due to anthropogenic global warming. Trees protect their roots from winter in a way similar to how we protect our cars with antifreeze. "With spring warming happening earlier and earlier," Oakes writes, the yellow-cedar trees "drain their pipes too soon. Without the antifreeze and insulation, they've vulnerable to bitter cold snaps." That much Oakes knew going in, but how are the forests affected by what is happening to the yellow-cedars? Oakes wanted to "get a sense of what was surviving, regenerating, or perhaps taking over," and whether any positive news could be found among the alarming signals. Oakes details the process of crafting her research question and selecting appropriate methods with which to study it. "Science demanded so many decisions [about methods] on a daily basis that fatigue set in," she notes. This choice for the book is a smart one, because it will help readers to understand the determination and doubt that accompanies scientists' relentless checking and double-checking in the field (or lab) to ensure that they are studying what they want to study in the most reliable way. "The forest would live on as the shape of its community changed," Oakes concludes. But economically and culturally, the yellow-cedars' dieback has hit hard. Oakes interviews 45 Alaskans about it — and it's fascinating to compare logger Wes Tyler's comment that the forest "was put here to use and to utilize and to make useful for people... a tree has no spirit" with Tlingit weaver Ernestine Hanlon-Abel's discussion of a "spiritual connection" with the trees. When Oakes asks Hanlon-Abel's niece and apprentice Cathy about the value of yellow-cedar trees, the niece responds that Oakes really was asking about the value of the Tlingit culture. "It's the same thing," she said. "They're interwoven." As the result of her research, Oakes became "an unexpected optimist against a backdrop of dying forests." Even so, her worry about global warming is profound. Linking it to the loss and grief she experiences over her father's sudden death, she dreams of motivating people to action. Place matters, she finds: Dire global predictions are too diffuse and easy to turn away from. Climate change's impact is more readily grasped when people learn about what is happening — to the forests or coasts, to the food and water supply — in their own backyards. Only once, on the book's penultimate page, does Oakes disappoint. If someone in a coffee shop asked her whether the yellow-cedar should be listed under the Endangered Species Act, what would Oakes say? Because it's a scientist's job to share information and "contribute objectively," she would "dance around the question" and recommend that live trees not be harvested where they are most likely to survive. Here is a weak answer and a lost opportunity (it even makes Oakes herself "cringe," she notes). Many scientists, including climate scientists, speak out publicly on policy issues when their data support doing so. In Search of The Canary Tree is a terrific book. Its message rings out clearly. When it comes to global warming, local action matters — reducing energy consumption, protecting vulnerable floral and faunal communities, educating others about climate change, and "holding space for optimism amidst despair."